To Frederic Bastiat (1801–1850), who sought for truth rather than outcome and never witnessed the fruits his labor bore. Obedience to conscience was his first rule; we witness the results. 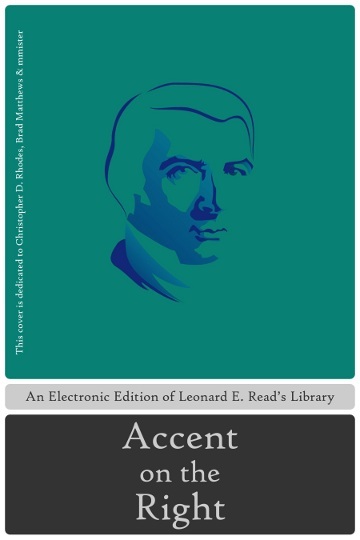 Leonard E. Read: Accent on the Right is a part of An Electronic Edition of Leonard E. Read’s Library. Print your own Leonard E. Read: Accent on the Right book at Blurb.com: Create an account at https://secure.blurb.com/my/account/login and then follow the instructions at http://www.blurb.com/pdf-to-book using the prepared PDF files from Leonard E. Read: Accent on the Right or your own edition of the book. The original book’s size is 6x9 Trade Book with a Softcover, printed on an Economy B&W, white uncoated paper. Congratulations, you now have an identical version of the Leonard E. Read: Accent on the Right prepared to be ordered for its printing costs.